Joshua and I took a vacation back in July ALL BY OURSELVES! I still need to post about it....I will. One day. And about two weeks before we were to leave, he received a jury summons. He was....shall we say, NOT happy. No worries, I told him. Just call and explain you have a vacation planned with your lovely wife and you will just not be able to attend. He did. And sure enough, they rescheduled! So, yesterday was jury duty day. I once served on a murder jury and let me tell you, that is something I NEVER want to do again. It was awful. I know it is our civil duty and all, but yuck. Josh was again not real happy about the timing of his jury duty because he was going to a Ranger game that night. Anyway, I got a call from him right after lunch. Hey! Did you get picked?? NOPE! And the moment this started, I KNEW I would not. It was an older lady going after a car insurance company. We laughed. We left State Farm when they were oh so not nice to us once. So, after being dismissed from Jury duty, my man was off to the ballpark. After an hour or so, I started to get text messages that contained pictures. I'm not gonna lie to you. 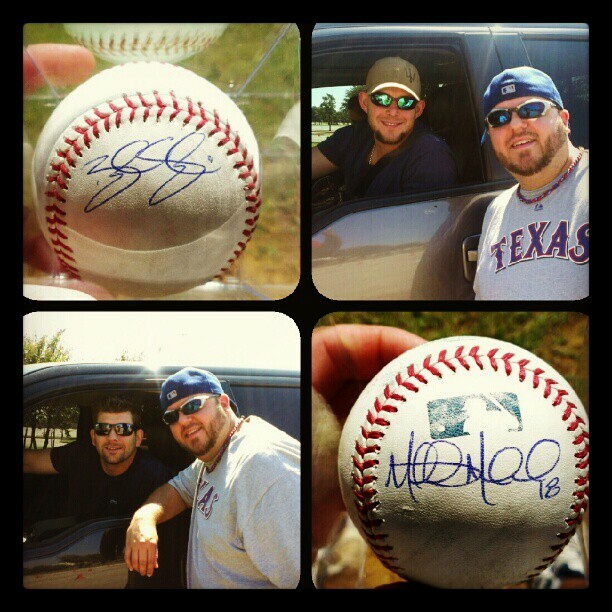 After these first four pictures came in...Mitch Moreland and Brandon Snyder....I was thinking. That boy is lucky! It is nice and sunny outside and he is talking to baseball players and I am stuck in my office working! His lucky day for sure...early dismissal from jury duty and then this! After a few more minutes, these pictures came. I love this one. 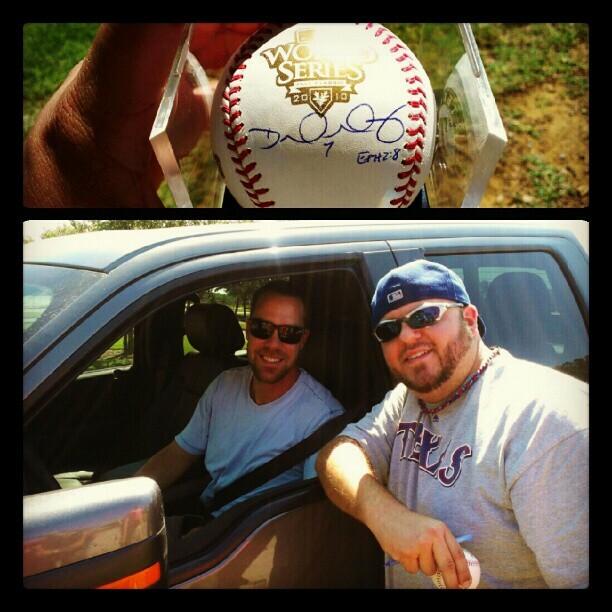 I am a David Murphy fan and I loved that the autograph is on a World Series ball from 2010. Very cool. And then I did not get anymore texts for a while, so I thought that was it. Holy Cow! 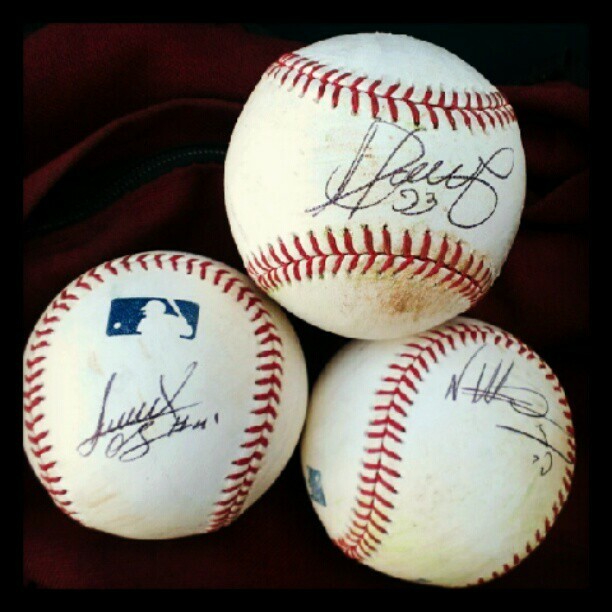 Martin Perex, Alexi Ogando, and Neftali Feliz! I was thinking how Luke would flip out when he saw all the new autographed balls. Do you see how clever my husband is?? I love you, Texas Rangers. 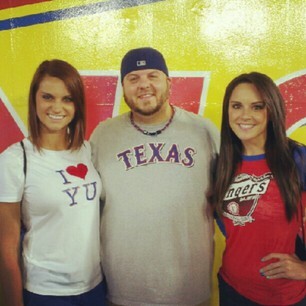 And he managed it with the two pretty girls from Fox Sports Southwest Girls! Too bad our Rangers lost.